June 23, 2016 / gracefulcanine / Comments Off on Frozen Stuffed Kongs – a dog’s best friend? 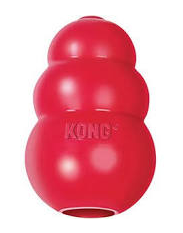 Kongs are cone-shaped toys made of tough rubber that can be filled with food and frozen. It will take time for your dog to lick and chew on it, to get all the food out. This will give the dogs something to do when the owners are away. Dogs often sleep after eating, so the benefits of a frozen stuffed Kong are doubled. Kongs can be used as a treat, and as a treatment (for working with or preventing separation anxiety). How do I get the stuffing into the Kong? Depending on the size of the Kong, you can use a small spoon or butter knife. The easiest way to stuff a Kong is with a pastry bag. If you don’t have one you can make one out of a Ziploc bag. Fill the bag halfway and zip it closed. Then you can cut off a corner and squeeze directly into the Kong opening. If you find the mixture leaking out of the hole at the bottom of the Kong, cover it with a small piece of cheese or kibble. You can use the bottom half of an egg crate or a muffin tin to hold several Kongs upright for stuffing. What do I put in the Kong? While you’re filling the Kong add extra, jackpots treats. Diced chicken or hot dogs, dog biscuits, cheese, banana, carrots, anything your dog loves. The hard pieces make the Kong last longer, so stuff as many as you can in there. Give your dog a frozen stuffed Kong when you leave for work. He may learn to love your departures, instead of fear them. Have your dog walker give him one in the middle of the day. Once your Kongs are filled, freeze them. A Kong stuffed with food and frozen can keep your dog busy and entertained for a long time. If you don’t freeze it, your dog will be finished in about ten seconds, and/or you’ll have melted yogurt all over the floor. You don’t need to buy a special Kong cleaning brush, you can use a toothbrush or a bottle cleaning brush. First soak it for a few hours in warm soapy water to loosen any dried on food. Kongs should be replaced if there are cracks as bacteria can grow in there. If your dog is a strong chewer don’t leave him unsupervised with a Kong. Watch him carefully to make sure he’s only eating the food. If he begins to break apart the Kong it may not be the right toy for him. If your dog is nervous around company, give him a Kong and let him sit in a quiet corner or his crate. He will learn to be relaxed around your friends.